We recently told you the story of Gus Andreone, the 103-year-old PGA of America member who (probably) became the oldest person ever to record a hole-in-one. Now, we have a story that starts on the opposite end of the age spectrum but is equally wonderful. 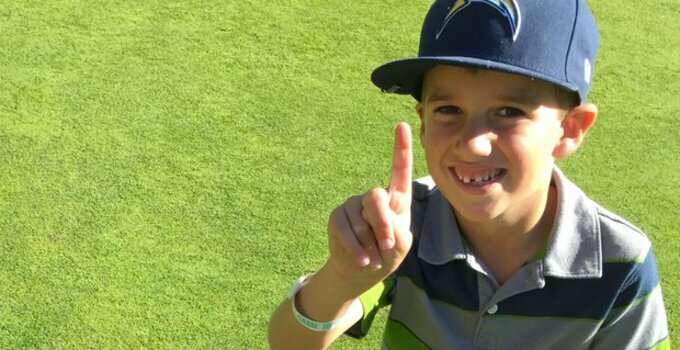 Thomas Browning is 6 years old and has won over 20 junior golf tournaments. So he knows what he's doing on the links. On December 26, he was playing at the Sycuan Resort’s Pine Glen par-3 course. On the 123-yard 10th hole, Thomas pulled driver and made an ace. On the 17th hole, Thomas struck again. From 108 yards, Thomas used a 27-degree hybrid, watching the ball hit just short of the putting surface before rolling toward the back hole location for a second hole-in-one on the round, which was the first time he'd ever seen the back nine on the course. The odds of that happening are pretty ridiculous. According to the National Hole-in-One Registry, it's a 64-million-to-1 shot. But, as his father Tim explained, Thomas wasn't as impressed with the second ace. Speaking as someone who's never had an ace before, I guess I don't understand how making a hole-in-one could ever get dull. The aces were big for Thomas' round, too, leading to a back-nine 27 -- 13 shots better than his front-nine score.